Building materials specialist, Ian Betts, and MOLA photographer, Andy Chopping, are working on a project to record and photograph surviving tile panels in branches of WHSmith. These tiles were made by Carter & Co. at their pottery works in Poole, Dorset in the 1920s. Commissioned by the retailer, they were installed in the entrance ways of a number of its branches. They were intended to advertise the wide selection of books and other items on sale, however their distinctive Art Deco style and the scenes depicted also expose a great deal about society at that time. This tile advertising post cards, from a branch in Newtown, Wales, reveal an increase in leisure time and the disposable income that people had to spend on holidays. In the 20s trips abroad became more common and sought after; as perceptible from this portrayal of travel to an overseas destination. 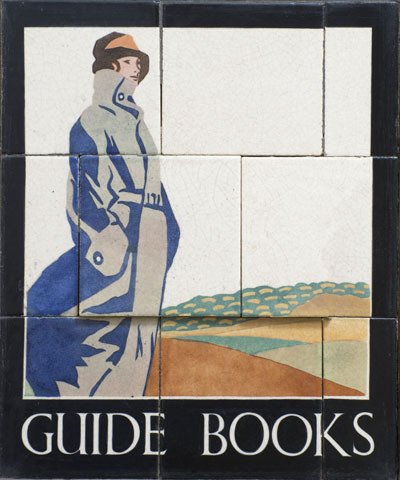 Similarly, this tile publicising guide books, also from Newton, is testament to a growing interest in outdoor pursuits, with walks in the Lake District becoming a popular pastime. The images exhibit a touch of Hollywood glamour, with the fashions and desires of the period shining through. In subsequent decades, particularly during periods of refurbishment from the 1960s, many shops lost their decorative panels, either being removed or covered over. Only seven branches of WHSmith are known to have their tile panels intact, with a few surviving in private collections. Many tiles were rescued by WHSmith and these can now be seen in a museum housed in the Newtown branch in Powys. Despite their importance, rarity and attractiveness, very little work has been undertaken on these panels previously. MOLA’s project will document all of the surviving WHSmith tile panels and photograph all of those that remain in situ. Further panels may yet be discovered in branches located elsewhere.